Konrad Vineyards and Camalie Vineyards, Mt. Veeder Appellation, Napa County California. A shared eKo Pro soil moisture monitoring network which spanned two vineyards separated by about a half mile was used to manage irrigation in these vineyards in 2008 and 2009. The results here show two very different irrigation paradigms being used in 2008 which led to a change of management in the poorer performing vineyard in 2009. In 2009 the yield improved by 120% with no quality impact while using less water. The soil moisture tension data gathered directly affected irrigation and management decisions. Having visibility into the status of moisture in the soil changes irrigation decision making fundamentally. Below is a map showing the two vineyards involved. The vineyard on the right, is Camalie Vineyards. The vineyard on the left, Konrad Vineyards, is owned by another Mt. Veeder grower, Dr. James Konrad. Different vineyard management companies were used to manage these two vineyards in 2008. Pulido Vineyard Management manages Camilie Vineyards which has been using wireless soil moisture monitoring for 5 years while Konrad Vineyards was first monitored in 2008. The vineyard management company responsible for Konrad Vineyards was introduced to the technology but, decided not to view or use the data directly. Instead the data was reviewed by Camalie Networks and observations presented to the vineyard owner who in turn provided input to the vineyard manager. The vineyard owner lives remote from the vineyard and is not able to visit his vineyard frequently. Konrad Vineyards produced .83 tons/acre in 2007 and with irrigation monitoring in 2008 an all time (9 year) high of 1.3 tons/acre. That's a 56% increase in yield in a year where most vineyards saw reduced yields as a result of spring frost. In 2009 with more aggressive use of the soil moisture data and new vineyard managment Konrad Vineyards yield increased again, this time by 120% from 1.3 tons/acre to 2.9 tons/acre. Camalie Vineyards produced 3.9 tons/acre in 2007, 2.2 tons/acre in 2008 due to cool weather during fruit set but, was back up to 3.9 tons/acre in 2009. The conclusion here is that with an underperforming vineyard even minimal attention to irrigation can have a dramatic effect on yield. This is not a profound learning but, it is a real quantitative result. We have observed that having the real time monitoring data results in more attention in general being paid to the vineyard which also contributes to improved performance. The first thing to notice in looking at the data is that the frequency of irrigations in 2008 is much different for the two vineyards. Konrad Vineyards received only about 10 irrigations all season with a gap of 7 weeks midseason. One reason for the limited irrigations was the difficulty of performing these irrigations. The reservoir is located far uphill from the vineyard with no electric power available. A siphon must be initiated and maintained to perform irrigation. At the beginning of the season it was decided to add subsurface drippers to block 1 on the vineyard, the top most block in the vineyard where node 519 is located. Unfortunately a difference in block labeling between the owner and the manager resulted in the bottom most block where node 521 is located receiving the sub surface dripper hoses. The top block is most exposed to the sun and wind and has higher ET than the rest of the vineyard which was the reason for adding subsurface drip there first. Because it didn't get sub surface drip it was the block to dry out the most which is evident most in the 36" depth data. This was communicated and the block was heavily irrigated in Week 37 of 2008. Node 518 was observed not to be receiving water in weeks 25 and 27 of 2008 while all other nodes were. This turned out to be the result of insufficient pressure in the submains to push water uphill from the submains to where Node 518 was located. The low pressure condition in the submains was the result of watering the three middle blocks of the vineyard simultaneously. When the irrigation set was changed in week 37 to water these blocks at different times Node 518 began receiving water. Visual examination of the vines above the submain revealed much lower vigor above the submain junctions. Approximately 500 vines were impacted by this irrigation pressure problem. As a result of the monitoring, attention to irrigation and the first fertigation in 5 years the vineyard yielded an all time high of 1.3 tons/acre in 2008 up from .82 tons/acre the year before. Changing vineyard manager in 2009 to Pulido Vineyard Management with Camalie Networks managing the irrigation and brokering the grapes resulted in doubling yield to 2.9 tons/acre in 2009 and tripling the gross income from the vineyard. Farming costs increased by 90% including profit sharing but, the result was still the first year of profitability for the owner since the vineyard was replanted in 2002. Web marketing of the Konrad Vineyards grapes in conjunction with detailed web based monitor data and a grower's blog by Camalie Networks was instrumental in achieving higher prices for the grapes. Soil moisture monitoring and the concommitant attention to the vineyard was valuable to the owner in that it enabled him to improve his yield to an all time high and enabled him to see first hand the irrigation management performance of his vineyard manager. In this case the monitor was useful not only in making irrigation decisions but, also in making a decision about who should manage his vineyard. Web based marketing and monitoring visibility further increased his margins to enable his first profitable year since replanting. Soil moisture data taken over the 2008 and 2009 growing seasons appears below for the two vineyards. Soil Moisture at 24" depth. Other characteristics to notice in the data are the differences in drying rates for different locations and different depths. These differences require different irrigation durations and intervals to keep a constant average soil moisture at a certain depth. Looking at the soil moistures at different depths reveals how deep the water is penetrating. If the water is going too deep beyond the root zones the durations and intervals should be shortened. Note that node 528 below node 518 was the wettest spot in the vineyard initially and dried out the slowest. It also had a very weak response to irrigation events including the large irrigation that was done in Week37 of 2008. In 2009 This block monitored by station 528 received almost no irrigation at all yet was one of the highest yielding blocks in the vineyard. Variation of the soil moisture even in this small 7.6 acre hillside vineyard is large requiring differences in irrigation volumes of more than 4X across the vineyard. The monitors enable the vineyard's irrigation to be managed on a block by block basis to reduce ripeness and yield variations. This approach is commonly referred to as Precision Farming. You will observe various high values and noisy curves in the soil moisture data particularly the 36 inch depth data for Camalie Vineyards. The noisy data is due to many nodes not yet having 36" deep sensors attached. Some nodes were moved to new locations during the season which also causes transients. Note that the data presented here is a "10,000 foot" overview of two years and two vineyards worth of data. 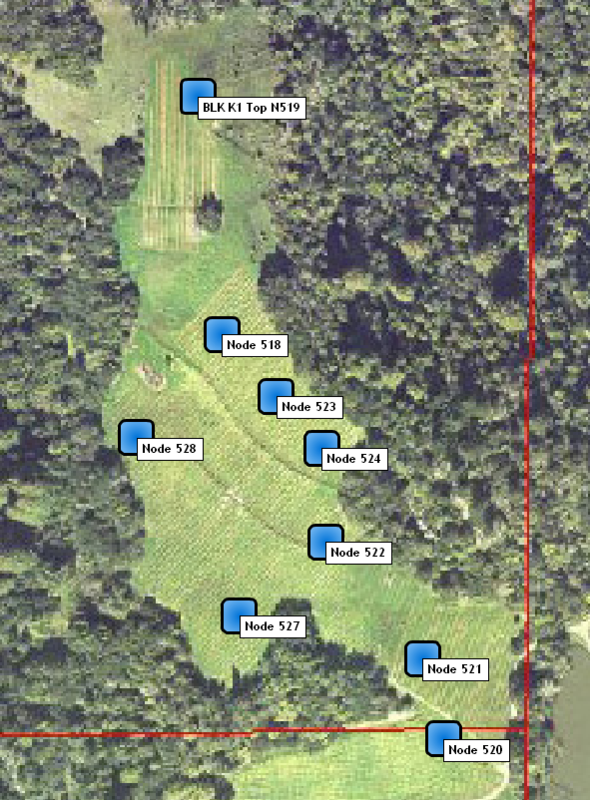 In making irrigation decisions data is viewed with fewer stations on each plot and a much reduced time frame. To view the data yourself at a different time scales up to the minute go to Soil Moisture. Block 6 is Konrad vineyards and blocks 1-4 are Camalie Vineyards. The two vineyards share the same satellite connection to the internet located at Node 0 in Camalie Vineyards. 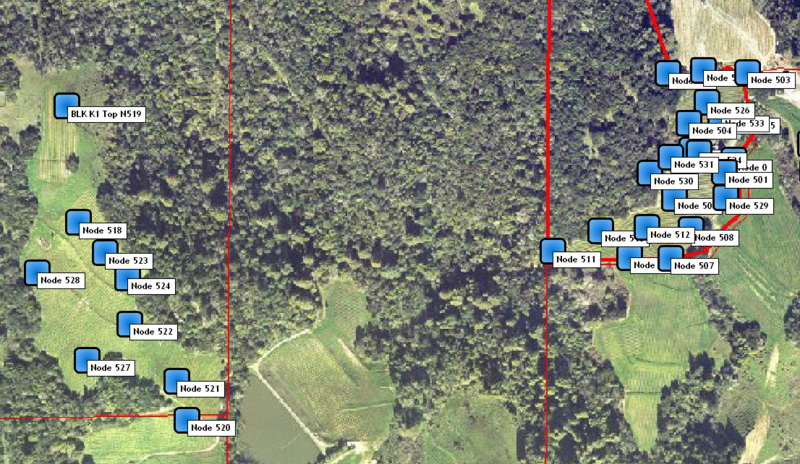 The 2 mile range of the nodes and packet hopping enables coverage of multiple vineyards with one network which allows splitting the cost of the gateway and internet connection among several users. Last modified: 1/26/10 Note on pronunciation: Camalie rhymes with "family"